The Kalmar DCF70-40E is the latest and final machine to join Cargotec's wide and successful range of 'F'-generation counterbalance equipment. The new empty container handler (ECH) is based on proven technology and features a cleaner engine with better fuel efficiency; new hydraulic and electrical systems; improved maintenance intervals; a more ergonomic cabin; and a state-of-the-art diagnostic system - all helping to lower the machine's total cost of ownership. Mikael Persson, Vice President of Cargotec's Reachstackers and Empty Container Handlers, says the new machine was designed to help customers cope with their ever-shifting inventory of empty containers. "At ports, inland terminals and distribution centres, customers' operations are increasingly overcrowded with empty containers, placing a great strain on their profitability. The need to quickly and effectively handle empties is a major industry concern. 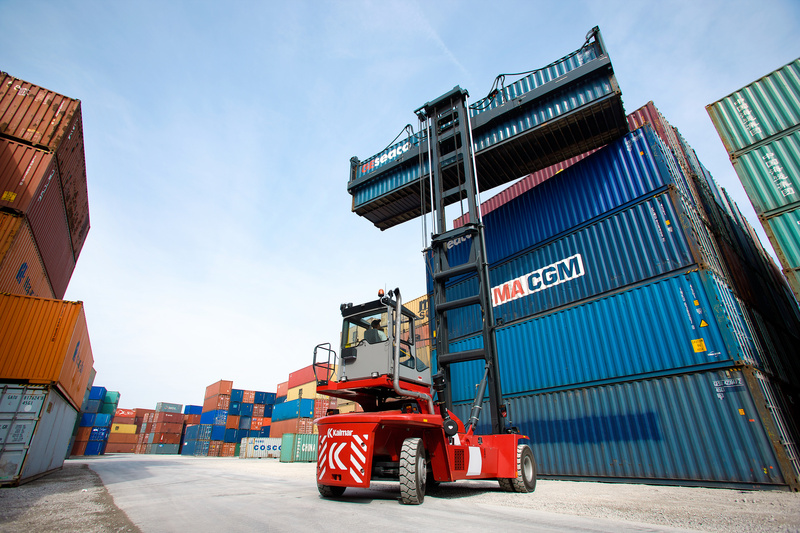 "The new Kalmar DCF70 is the ideal solution for customers requiring lifting capacities of up to seven tonnes and stacking heights of four- or five- high. Although it is the smallest empty container handler offered by Cargotec, the machine has been built as a workhorse, able to handle a great deal of wear and tear with unmatched reliability and cost-effectiveness." With better torque and smoother gear shifting, the Kalmar DCF70 is powered by a 129 kW engine offering quick acceleration, better manoeuvrability and the industry's fastest average lifting speeds - equalling more moves per an hour. The new machine also helps customers meet their environmental responsibilities with a drive train that complies with emission requirements, in addition to sound and vibration standards. It also abides Step III and Tier 3 regulations, effectively meaning that Cargotec now offers a complete range of empty container handles able to meet the demands of a broader spectrum of customers. Improved reliability and availability are also key features of the Kalmar DCF70 unit, incorporating only the tried-and-tested components. Furthermore, the machine's maintenance intervals have been extended from 250 to 500 hours reducing downtime and enhancing productivity. Availability is further ensured with a CAN-BUS control system providing fast, accurate troubleshooting and alerting the driver of any problem on a need-to-know basis. Already, the new machine has been well-received by the market. A long-time German customer of Kalmar equipment praised a DCF70 demonstration unit for its optimal visibility and performance, especially considering the machine's capacity. 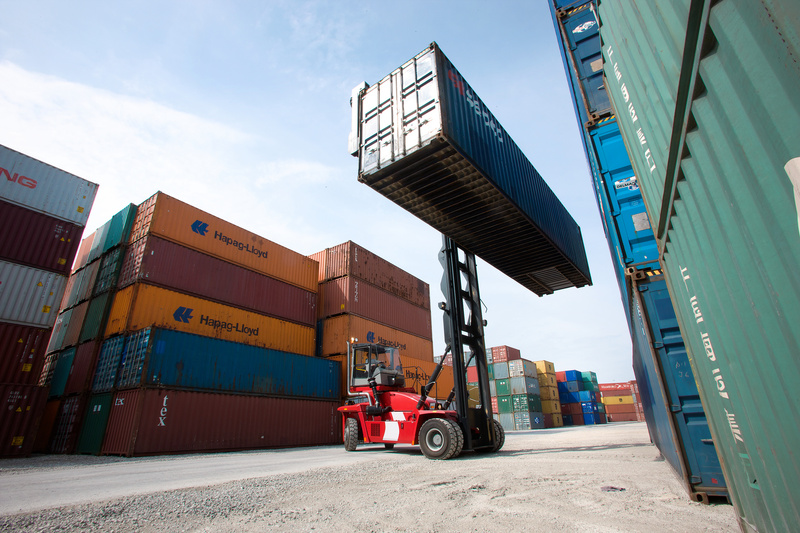 The customer, who currently operates with four Kalmar DCF100 units, must handle empties quickly and efficiently to keep up with the demands of its fast-paced logistics business. Photo 1: Based on proven F-generation technology, the Kalmar DCF70 ECH features faster lifting speeds, unmatched reliability and improved cost-effectiveness. Photo 2: The new Kalmar DCF70-40E completes Cargotec's wide and successful range of F-generation Kalmar counterbalance equipment.